Hawaii, Hamakua and Kukaiau Mill Co., clear strike of each straightline handstamp (Davey 603, 607) on 2¢ brown (75), Very Fine and scarce pair. 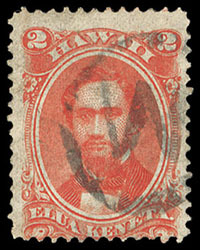 Hawaii, Large W in circle, clear strike cancels 2¢ rose vermilion (31), vivid color; small flaws, a Very Fine and rare strike, Rarity 1RRRR. Gregory No. lettW-22 Estimate $200 - 300. Hawaii, 1817-1822 Bishop Family Correspondence, four folded letters involving one of the original Hawaiian Missionary families; datelines include Ship Thames/Atlantic Ocean Lat 37; these letters are not to or from Hawaii but are written regarding this famous Missionary family including Elizabeth Bishop, F.-V.F., ex-Fitzpatrick (no photo). 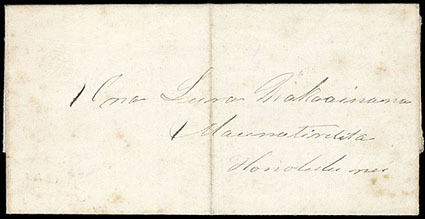 Hawaii, 1852 Legislature of Hawaii Covers, two hand carried local Honolulu folded letters addressed to Legislature Representatives regarding land and salary matters, with one signed by King Kamehameha III, both datelined "Honolulu, June 13, 1852", Very Fine. Hawaii, Princess Kaiulani Place Card for the Royal Birthday Ball of King Kalakaua, 1886, multicolored Royal Arms on Mantle invitation card (205x146mm) with hand drawn and colored by Iolani Palace artist Isabel Strong (signed in lower left corner), showing skillfully executed watercolor painting of Pageboy Holding a Tray with Bouquet of Flowers, and legend reading "Her Royal Highness Princess Kaiulani" multicolored with princess name and drapery embellished with multicolored glitter, Very Fine. 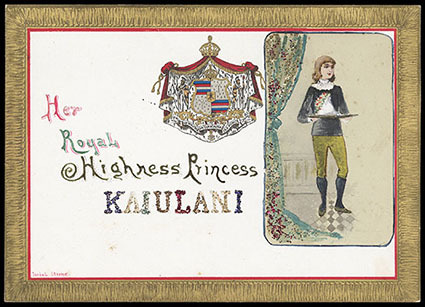 THE UNIQUE ROYAL PLACE CARD OF PRINCESS KAIULANI FOR THE 1886 ROYAL BIRTHDAY BALL OF KING KALAKAUA. 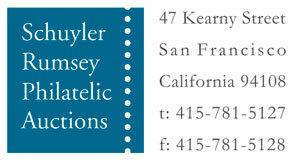 Very few artifacts exist in private hands relating to Princess Kaiulani. According to Medcalf's work on royal stationery, the largest correspondence from Hawaii's favorite Princess is in the Hawaii State Archives. Her autograph is often found on photographs, but due to the demand, it is close to impossible to acquire her writings. Even her royal stationery is unique and in the Lyman House Memorial Museum in Hilo.